Telford is now 14.5 years. This is an increase of 102.47 per cent between the credit crunch fallout year of 2009 and today, but still it is a 27.55 per cent drop in moves by homeowners, compared to 15 years ago (The Noughties). 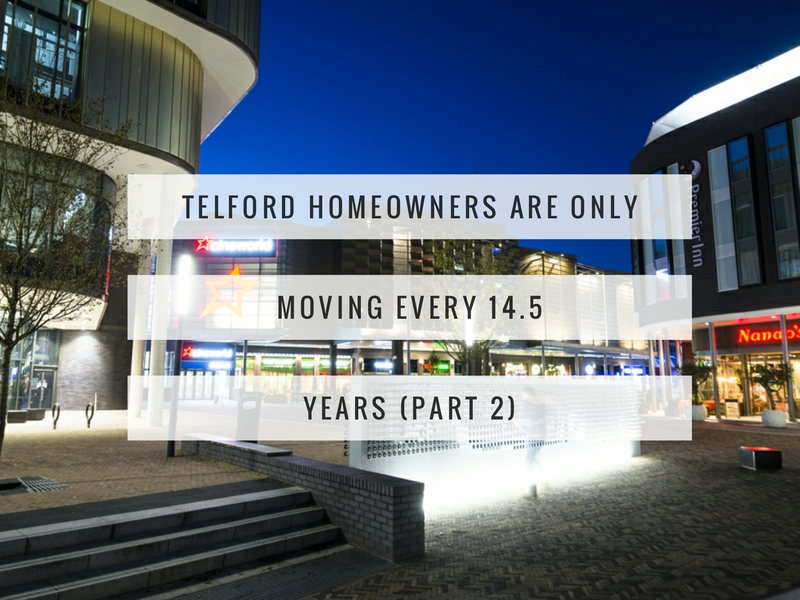 So why aren’t Telford homeowners moving as much as they did in the Noughties? The causes of the current state of play are numerous. In last weeks article I talked about how ‘real’ incomes and savings had been dropping. Another issue is the long-term failure in the number of properties being built. Only a few weeks ago in the blog, I was discussing the draconian planning rules meaning housebuilders struggle to locate building land to actually build on. So, what does this mean for Telford homeowners and landlords? Well, if Telford people are less inclined to move or find it hard to sell a property or acquire a new one, they are probably less likely to move to an improved job or a more prosperous part of the UK. This means that there could be an opportunity for Telford buy to let landlords to secure larger properties to rent out, as the demand for them will surely grow over the coming years. As for homeowners; well those in the lower and middle Telford market will find it a balanced sellers/buyers market, but will find it slightly more a buyers market in the upper price bands.